This blog will perhaps be mainly about fashion and accesoires. So I will start with one that I love since I bought it. Due to problems with my back I am not allowed to carry heavy handbags anymore. As I only own a black Dakine backpack, that is not every cute thought it has a pink floral print, I was looking for a new backpack, that I could wear everyday. I found a few ones online, but this was the one I fell in love with, not only because it was cute, but also being very well crafted for the price of 30 euros. And it has owls on it! You can also store so many things in it. My normal grocery purchase fits in there. Okay, sometimes I have to carry two or three things on my arms. But still: It is a cute alternative to my bigger backpacks. I was just a little upset, that it isn't avalible in pink... though I din't even like pink. Maybe a pale pink... now its green, which works every well with the brown. 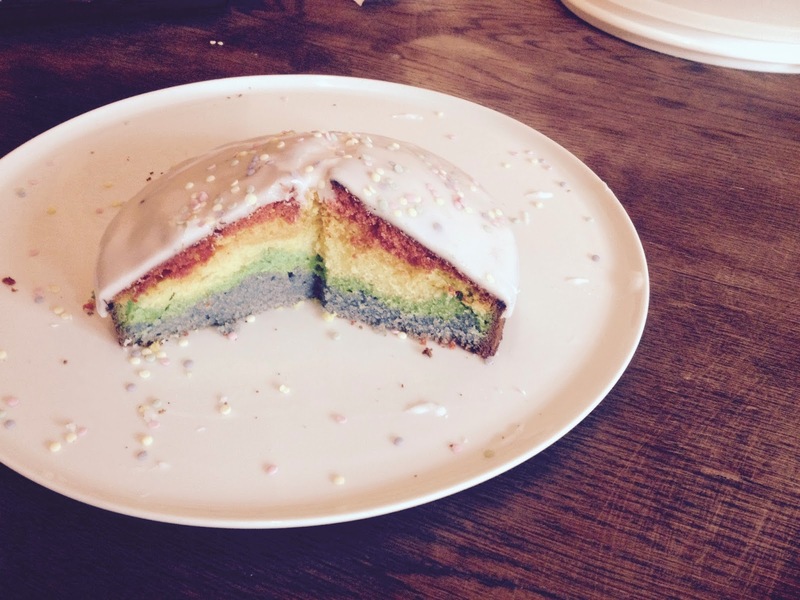 And I recently baked a rainbow cake. Why? Because of reasons. I was not ecaxtly bored, but as a friend of mine mentoined a rainbow cake, I wanted to bake one. Since I don't like most "dry" cakes, but love lemon cake, the decision, what cake it would be, was easy. And it turned out very well. And one with hipster redering! Whoa! A rainbow cake in pastel colours. So hipster.